Almost everyone experiences back pain at one time in his or her life and the Back WRAPZ solves the problem with great efficiency. Simply heat or freeze the WRAPZPAK and drop it into the Back WRAPZ sleeve. The product wraps around your waist giving you high performance compression therapy. 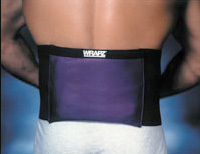 The Back WRAPZ is available in four sizes. It also works for rib and hip injuries. Waist up to 30 in. Waist 30 in. to 40 in. Waist 40 in. to 50 in.